After we did the Cleveland Museum of Art, it was time for a late lunch. We wanted something interesting, but not something that was going to be heavy enough that we wouldn’t be hungry come dinner. After a little bit of discussion, we decided that it was time to check out Happy Dog on the West Side, known known for their wide variety of hot dog toppings. Okay, I can already feel the skeptical vibe coming from some of my readers. 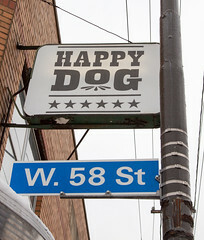 The world has a lot of hot dog places, what makes a place like Happy Dog worth some of your precious stomach space? And I’ll be the first to admit, hot dogs as a menu item are often a high-risk item: while there are a lot of really great hot dog places out there (Indeed, I’ve reviewed about 20 on this site), there are a lot of dubious ones as well, and for every lovingly-assembled Gold Coast Chicago Dog, or pepper-relished-covered Blackie’s hot dog I’ve had, I’ve also been served up more than my share of Oscar Mayer 10 per lb hot dogs slapped onto a stale bun with ketchup and mustard to know that hot dogs generally aren’t the sort of thing I get without doing some research first. 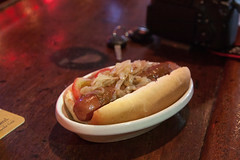 But I’ll tell you that from my visit, Happy Dog isn’t one of those places, instead, they are a great dive-ish joint that’s serving up some really great hot dogs with some good toppings. So, let’s work our way through all the things that make Happy Dog great. First of all, despite the focus on hot dogs, Happy Dog is a bar that serves hot dogs, not a hot dog place that sells beer. There’s an important different there, especially when it comes to ambiance, but this is definitely a “bar”. 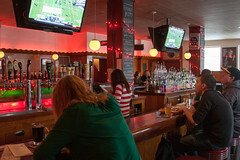 Walking in the door, the interior of Happy Dog, it’s like you are walking into the bar area of a bowling alley on the wrong side of the tracks: the colors are subdued, the lighting a bit dim, the seating a little dilapidated, and the floorspace dominated by a bar and a small impromptu stage. Nothing wrong with that, indeed, I usually like divish places like this, since it means the people here care about their beer more than maintaining a TGI Friday’s atmosphere. Then you sit down, order up some beers, and the bartender then comes by with a couple of stubby pencils (again, like a cheap bowling alley) and half-sheet menus for ordering your dogs. The hot dogs are $5 each, with your choice of a real hot dog or a fake veggie one, and then all of the toppings you can cram on there from the list. Let’s start with the building blocks, however. This isn’t your run-of-the-mill generic hot dog, the hot dogs at Happy Dog are custom-made, quarter-pound each, coarse-ground and extra spicy hot dogs from Blue Ribbon Meats, a local purveyor of sausages. These are a good quality hot dog, with some quality meat, some good spice, and a nice texture from the coarse grind. I’d actually say these were similar to a slightly milder version of a Polish Boy or a Half Smoke, but in any case, Happy Dog starts with a great dog. Then they put that dog on a bun from Orlando Baking on Cleveland’s Near-East Side, for a bun that’s got a little more heft than your standard side-split bun. But then the toppings are where Happy Dog really puts it into overdrive. As I mentioned above, the hot dog menu takes up half a sheet of paper, with a total of 50 standard toppings (plus a few specials and secret toppings as well). I’ve been to a lot of places that have a lot of hot dog toppings, but usually “a lot of hot dog toppings” means “standard condiments, chili, kraut, cheese, and maybe some pepper relish”. Here, it means everything from the ordinary (#3, Ordinary Yellow Mustard), to upscale versions of standard condiments (like #2 Chipotle Ketchup, #20 Alien Pickle Relish, or #28 Yuengling Sauerkraut), to unusual (#34 Marinated Cremini Mushrooms or #15 Brazilian Chimichurri), to the downright excessive (#49 Sunny Side Up Egg, #31 Pimento Mac and Cheese, or #30 Bourbon Pork and Beans). And on top of that, most of these aren’t the short of topping where you just order a can from the Sysco truck and dish it out; most of the sauces and relishes are house-made, and several of the items are freshly prepared. This is truly one of those over-the-top lists of toppings, way more than I was expecting. 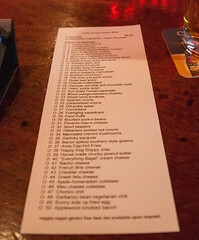 Sure, there are a few dubious toppings on the list, like item #29, Coco Puffs. I’m sure if I lived there I’d eventually I’d go cuckoo for Coco Puffs and try it out, but I’m also pretty sure that I’m not missing anything by not trying it. The fries are similar, they’ve got the options for fries or tater tots, with a list of toppings that’s still extensive, but a subset of those available for the hot dogs. And adding to the rest of that, they’ve also got 20 beers on tap, focusing on regional small breweries for most of the taps. So from a conceptual standpoint, this place is great. So, how were the actual hot dogs? Aside from some amount of decision paralysis brought on not only by the sheer number of topping options, but the various combinations thereof (according to the waitress, the only real limit with toppings is that at some point they run out of room to keep adding them, which happens around 10 toppings), my mental combinatorics come up with about 10 billion possibilities, which drops to about 100 million when I rule out toppings I find completely uninteresting, it took me a while to come up with my first dog: chopped Roma tomatoes, escarole, pickled onions, and chopped applewood smoked bacon. And when the dog arrived a few minutes later, the dog was everything I expected. The hot dog itself was a good, solid dog. The roma tomatoes were fresh, the escarole nicely sauteed and garlicky, the pickled onions exactly like what I’d expect from a good taco cart, and the bacon chopped and applied none-to-sparingly. The resulting hot dog was a nice combination of flavors and textures. Carol went a bit more conservative with her first dog, going for caramelized onions and mole, but the resulting dog worked well, with a nice combination of onion tastes and sweet-but-spicy mole. 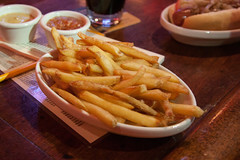 The fries were similarly good: nice crisp fries that were nicely complimented by the sauces, in our case, thai chile and garlics sauce, and black truffle honey mustard. 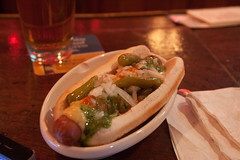 In fact, the latter of these was so good I opted to include it on my second hot dog. Rounding out our hot dog orders, my second dog was a combination of my favorite spicy toppings (Black truffle honey butter, sriracha, chimichurri, onions, and sport peppers), and I was pleased with this. This was more than a little spice (albeit from several competing cuisines), which worked with the nice spicy hot dog. I’d get this again, although the habanero hot sauce will make it on there next time. 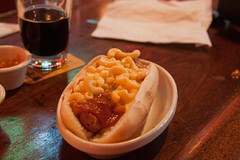 Carol’s second dog, meanwhile, was all the guilty pleasure toppings (mac and cheese, baked beans, and mole), and while that wasn’t a combination I’d go for every day, mac and cheese makes for a pretty good hot dog topping. Overall, I was really pleased with Happy Dog. 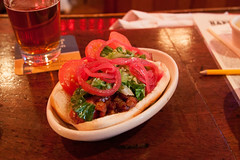 They start with a good hot dog, and have an impressive list of toppings (in both length and quality). Unlike a lot of hot dog places, the list wasn’t a gimmick, but the cornerstone of a great hot dog eating experience. I could easy see coming back a half dozen times before growing tired of this particular topping list. Starting with one of my trips to Seattle more than 20 years ago, I had noticed that the Seattle area has a distinct love of fish and chips, with the region having more fish and chips joints that I’m accustomed to, even for a fairly large area. Indeed, I’ve remembered more than a few trips out for fish and chips at Spud Fish N’ Chips after having beers with college friends in Kirkland, and even having more than one person in Alki get in an argument over which of the two Alki establishment (another of the Spud locations, or Sunfish just down the way) was the One and True[tm] place for fish and chips. Seeing that our Death March route had us looping around Green Lake in northern Seattle, it seemed almost mandatory that we at least stop by for a quick mid-day snack (at this point, we were right about the nominal halfway point). (And, confession time: we had originally planned to finish at Sunfish for comparison, but we got behind schedule and didn’t make it out there).